What do nurses, cashiers and construction workers have in common? All three occupations require their participants to spend hours every day on their feet, which means people who work these jobs tend to experience foot pain. If you work at a job that requires you to spend many hours on your feet per day, keep reading. You and your feet don’t have to suffer through your chosen career. Instead, reduce your pain by following the four steps below. Compression socks are used to prevent deep vein thrombosis (DVT), or blood clots in the legs, for people who are more susceptible to DVT because of a recent surgery, a medical issue like diabetes, or the type of work they do. DVT happens because gravity naturally causes more blood to pool in your feet. The more time you spend on your feet, the more blood can pool, causing foot pain, aches and an increased risk of blood clots. Compression socks compress the veins in your legs, encouraging blood to flow up to your heart. If you spend a lot of time on your feet, consider investing in a high-quality pair of compression socks to both lower your risk of blood clots and decrease your foot pain. If you choose to wear compression socks, remember that you need to wear them correctly — wrinkles in the socks can hurt your legs and damage your veins. Make sure to choose the right size, too; socks that are too big won’t work, and socks that are too small can damage your veins. 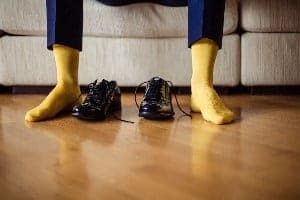 A good pair of shoes from high-quality brands can cost a lot of money upfront, but when you work on your feet, it’s crucial to have well-fitting shoes with adequate arch support. The initial investment pays off in reduced pain levels and a lowered chance of long-term health problems related to standing for too long. Additionally, good-quality shoes with the right amount of arch support don’t just help your feet. They also improve your posture and reduce pain in your back, neck, shoulders, knees or any other parts of your body that ache at the end of your workday. If you don’t want to or can’t invest in new shoes right now, you might consider getting insoles, or shoe inserts that support your arches. While you can find insoles at your local pharmacy, you can also visit a podiatrist who can create a custom pair of insoles that offer maximum support. When you get home from work, don’t immediately head into the kitchen or hit the gym. Instead, give your feet a break: sit down and elevate your feet to encourage blood circulation and take some pressure off your feet and knees. Try to give your feet at least 20 minutes to recover. If your feet feel more swollen than usual, consider icing your feet and taking over-the-counter anti-inflammatories to lower the swelling. You can also use a compression bandage or compression socks to encourage better circulation and reduce swelling. During your lunches and 15-minute work breaks, take some time to do some simple foot massages and exercises. Start by gently rolling a tennis ball beneath your arches to stretch out the muscle. Next, try some easy calf and knee exercises to stretch your muscles and encourage blood flow. For instance, pull each leg gently towards your glutes to stretch out the calves. You can also circle your hips in a figure-eight shape to stretch out aching hips. Simple lunges stretch your knees and thighs as well. Along with exercising and stretching for brief periods at work, consider adding yoga or other flexibility-based practices to your typical at-home exercise regimen. Increased leg flexibility and strength can make a huge difference in how achy your feet feel at work. Plus, exercise also helps you lose weight, which decreases the stress you put on your feet. Yoga is also helpful for people with foot pain who should avoid exercises like running and jogging. To lose weight and strengthen your body without hurting your feet, try other low-impact sports like swimming and bike riding. When you follow these tips, you’ll be well on your way to reducing foot problems and foot pain, no matter how many hours you spend on your feet each day. Looking for the right graduated compression socks for your needs? Turn to SMOOTHTOE® and VO2FX®. Check out SmoothToe to find the right socks for you today. If you want more tips on foot care and pain relief, be sure to read all of SmoothToe’s blogs.